A surprise diamond in the rough from originally College of the Canyons and then later at Cal, JJ Arrington ran for at least 100 yards in every game for the Golden Bears in 2004 piling up 2,018 yards. The yards were be the most since Marcus Allen, and this earned Arrington All-American Honors. He was drafted by the Arizona Cardinals in the second round of the 2005 draft and immediately penciled in as the team’s starter at tailback to replace retiring Emmitt Smith. It was rough for Arrington to adjust to the pro game. He ended up splitting time with Marcel Shipp and started only 5 games, but gained 370 yards on 112 carries and scored 3 TDs. JJ got moved to kick returner the following season as the team’s infatuation with free agent runningbacks shifted to Edgerrin James. Arrington saw little time in the backfield. Still he had a banner season as a returner with 67 returns for 1520 yards, a 22.7 average and a 99 yard touchdown. As Arrington finally saw a breakthrough taking the #2 slot behind James in 2007, the team used him sparingly and primarily as a 3rd down back/ kick returner recording 29 receptions for 241 yards and a touchdown. He’d have his best season in 2008 as a kick returner, only returning 36 kicks for 923 yards- but was relegated again to 3rd string behind Tim Hightower. He’d make good for a 25.6 yard average and a 93 yard touchdown. 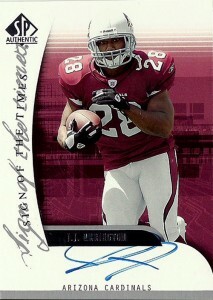 Arrington again caught 29 balls for 255 yards and a TD, helping the Cardinals reach their first Superbowl. When the season concluded, JJ was cut by the Cardinals after undergoing microfracture surgery on his knee. In 2009, the Denver Broncos took a chance on Arrington signing him to their backfield. He’d be an ideal fit for their system- but failed his physical due to the knee, and was cut. JJ signed with the Broncos again in 2010, and looked good in camp, so good that Denver traded him to the Eagles, but he’d be released prior to the beginning of the season. JJ played for the Las Vegas Locomotives of the UFL in 2011 but after a lot of buzz on the signing, he was cut by the team. Currently he remains a free agent.